There was a happy looking gentleman sitting on a chair outside of this East Village store. We walked into a very tiny dark store that sold used knicknaks like deconstructed watches, old clocks, typewriters, sunglasses, costume jewelry, street signs, stop signs, and trumpets. We learned from the owner that he used to be a trumpet player. 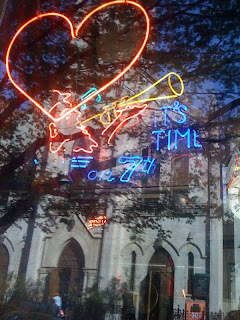 This neon sign on the store's window is a rendition of him during his glory days as a trumpeteer. This is also how you'll find his store since his store has no name. 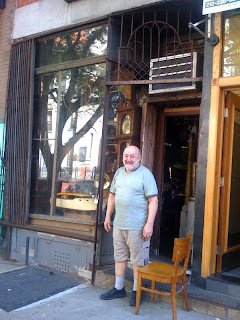 And below is a photo of the store's very charming owner Anthony. We noticed that past the front area, there was a small back area, which we learned was Anthony's living quarters. So this store was actually his ground floor apartment. Anthony even invited us to take a look back there in his home - a modest and cramped looking area with a bed, small dining and small kitchen area. We were surprised that he trusted us to look around his apartment area while he waited outside. Our favorite things we saw were old photos of him and the store, his trumpets, and his baby grand piano in his apartment. There are no price tags on any of the items - he told us that he wants people to pay for the items what they are willing to pay and what they think it's worth that will make them happy. Anthony was one of the most down-to-earth and welcoming people we've ever met. We'd like to go back to the store just to sit outside with him and hear some stories. We have a feeling Anthony has some great stories of old New York. We left Anthony's store with this great childhood memory. We've been playing this almost every night before bed. We're easily amused.